With so many brands and types of yogurt out in the market, it’s hard to know what yogurt to choose for optimal nutrition. Some are super healthy breakfast or snack foods to consume, while others are high in sugar and artificial sweeteners and actually not very healthy at all. With all the confusion out there, I thought I’d share some tips on what makes a yogurt healthy and how to choose the right one. Greek Yogurt vs. Regular Yogurt? Yogurt is basically a form of curdled milk. Regular yogurt is made by fermenting milk with live bacteria and can be made with differing fat levels. Greek yogurt takes an additional step of straining the yogurt so that the liquid whey is removed resulting in a yogurt that is thicker and creamier than regular yogurt. “Greek-style” yogurt is regular yogurt that has been made by adding thickening agents to achieve a thicker and creamier texture but is not strained like traditional Greek Yogurt. Because Greek and regular yogurt are prepared differently, the nutrition content also varies. Check out the nutrition content for a 6 oz. serving for various types of yogurt. Good for your digestion. Most yogurts contain “good” bacteria known as probiotics which are live cultures that live in the intestine and actually help drive out “bad” bacteria and aid with digestion. High in Vitamins and nutrients. Yogurt is a great source of calcium and also Vitamin D. In addition, just one serving is high in potassium, phosphorous, riboflavin, iodine, zinc, and vitamins B5 (pantothenic acid) and B12. May help prevent high blood pressure. Because yogurt is high in potassium, it helps flush out some of the sodium which may help lower blood pressure according to a study published in the American Journal of Clinical Nutrition. Can be an excellent source of protein. Greek yogurt if processed properly is high in protein which will help with satiety and curbing hunger throughout the day. Be sure to read the label and choose one that contains at least 12g of protein if you’re looking to increase protein intake and maintain or build lean body muscle. How to Choose the Right Kind? The most important part about choosing the right yogurt is reading the labels and knowing what to look for. Here’s some tips for what to look for to help you make the best choice. Sugar Content. 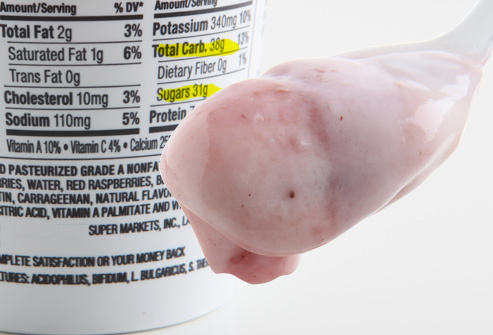 Today many flavored yogurts are full of added sugars and other additives. Some contain as much as 28g of sugar in one 6 oz. serving! That’s roughly as much sugar as there is in a 8 oz. cola. Sugar causes a spike in our blood sugar levels and any excess sugar gets converted and stored as fat so you definitely want to minimize the amount of sugar in the yogurt you choose. I would choose something between 7-15g of sugar so plain yogurt or honey flavored are the ways to go to minimize the sugar content. Often times the fruit flavored yogurts don’t use real fruit and just add to the sugar content with little to no added nutrition. Calories and Fat. Choose non-fat or low-fat yogurts to maximize nutrition content without the added calories and fat. Choosing the lower fat version will save you between 30-50 calories per serving and about 3-7 g of fat. Vitamin D. Many of us consume yogurt as one of our 3 recommended servings of dairy. However, not all yogurts are fortified with Vitamin D. Vitamin D is important because it helps aid in calcium absorption as well as a number of other health benefits I wrote about earlier here. When choosing regular yogurts, look for ones that are fortified with Vitamin D. Unfortunately, very few Greek yogurts are fortified with Vitamin D today so if you go with Greek yogurt it will be harder to find one with Vitamin D so make sure you’re getting Vitamin D from other sources. Probiotics. While all yogurts contain some bacteria through the fermentation process, today several types contain live cultures called probiotics that help aid digestion by adding to the healthy bacteria in your stomach. When possible, it might be helpful to choose yogurts that contain probiotics to aid with digestion. Protein Content. The reason Greek yogurt is so healthy is because of the high protein content. Generally traditional Greek yogurt contains at least double or up to triple the protein content. Having a higher protein content helps with satiety and prevents overeating so could help with weight loss. Don’t forget to read the nutrition labels and follow the guidelines for sugar content and protein content in particular. Some yogurts contain as much sugar as a can of coke or soda so be sure to check that when choosing your yogurt. If you’re looking for “greek” yogurt for its higher protein content, make sure to actually look at the label and read the amount of protein. Often times the front of the label or the yogurt may be called “greek-style” yogurt which just means it’s thicker and creamier by the use of thickening agents but it actually doesn’t have any additional protein. Look for 12g or more per serving for a true “greek” yogurt. 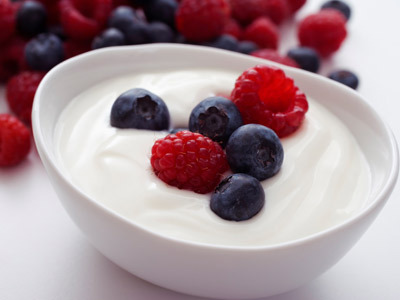 Choose plain or honey flavored yogurt over fruit flavored yogurt to lower sugar content. Try adding fresh or frozen fruit or honey instead to make it a bit sweeter! While yogurt tastes great plain or with fruits and granola, you can also use non-fat yogurt or greek yogurt as a substitutes for cream in many dishes as a healthy alternative. I’ve used it to make healthy creamy pastas, in smoothies, as a replacement for mayo, to make ranch dip, and more!